Aside from gallivanting around Western Massachusetts, another fun thing I did last week was my long run. My two sisters-in-law and I have been talking about doing a long run together for quite a while, and it finally worked out! It’s a little tough to get all together with everyone’s schedules, and I live a bit far away from them (about a 40 min drive), so I don’t often get to join them. But this weekend was good for everyone, so it finally happened. The two of them live fairly close to each other, and they also both live near running/bike paths, so we picked one of those, and met up for our run on Saturday morning. The plan was to run 8 miles together with the option of adding on extra to the end if anyone wanted to. I ended up sticking with 8, but both of them went longer (I think 10 and 12 miles). My niece also came along for the ride in her brand new jogging stroller! I think she slept most of the way while her mom did all of the hard work. I took a (short) turn pushing the stroller towards the end of the run, and while it wasn’t as physically difficult as I imagined, it was really tricky having something else to focus on. Maybe next time I’ll take a longer turn and get a better idea of the difficulty. We’ll see. Sunglasses, check! Camelbak, check! Giraffe, check! Before heading out, I was nervous that they would be a little too quick for me, but I really shouldn’t have been. I told them I was worried about it, and they agreed to take it slow if I needed to. In the end, we ended up around the same average pace that I have been doing in my long runs. The whole thing went by really quickly. With three of us, there was at least one of us talking the whole time, and that was a great distraction. Do you think long runs go by quicker with friends? 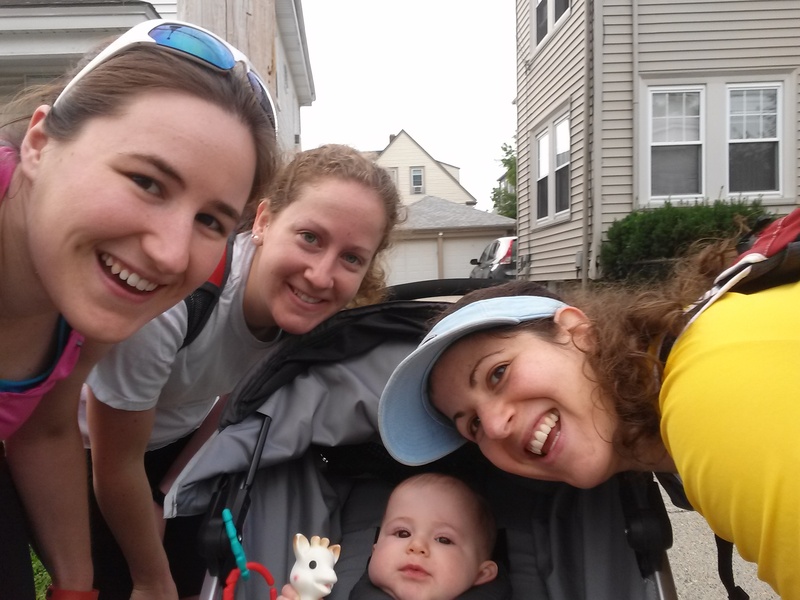 Have you ever pushed a running stroller? Do you bring a giraffe when you exercise? ← Recovery Week: Adventures in Western Mass. Yeah, I was really worried about slowing them down or (more likely) pushing myself to run faster and then crashing, but everything worked out fine. The way you do it with your run club sounds like a good idea, we’ll probably try something along those lines if our paces end up differing a lot. i absolutely cannot talk while I exercise. it’s one of the reasons i prefer to ride alone. i can manage a sentence here or there, but not full blown conversations. i need to focus too much on my breathing rhythm. You should definitely bring a giraffe…affix him/her to your bike like a hood ornament! Group runs do seem to go by quicker, but I’m always worried I’m slowing everyone else down. Glad to hear you found people with the same pace as you! Yeah, whenever I run with other people I’m worried either that I’m slowing them down or I’m running faster than normal and will blow up at some point. But when it works out, I do enjoy the company. Courtney has that giraffe, too! Sophia is a popular one! If I were running I would not take baby or stroller, boy, that’d be dangerous! But, Sophia would be more than welcome to join! Let’s bring the giraffe for the turkey trot!